Follow Me.Sifting for God's Will - Follow Me. This article by seminarian Danny McShane will appear in the November-December issue of Into the Depths, the bi-monthly newsletter of the Office of Priestly Vocations of the Diocese of Peoria. To subscribe to this newsletter, please contact us. Discernment literally means “to sift through.” The goal of any sifting is to find something valuable that presently remains hidden. Police sift through evidence to find clues, and miners sift through dirt to find gold. The Christian, however, sifts through his or her own prayer and experiences not to find material clues or wealth, but the spiritual clues that point towards the wealth that is God’s will. 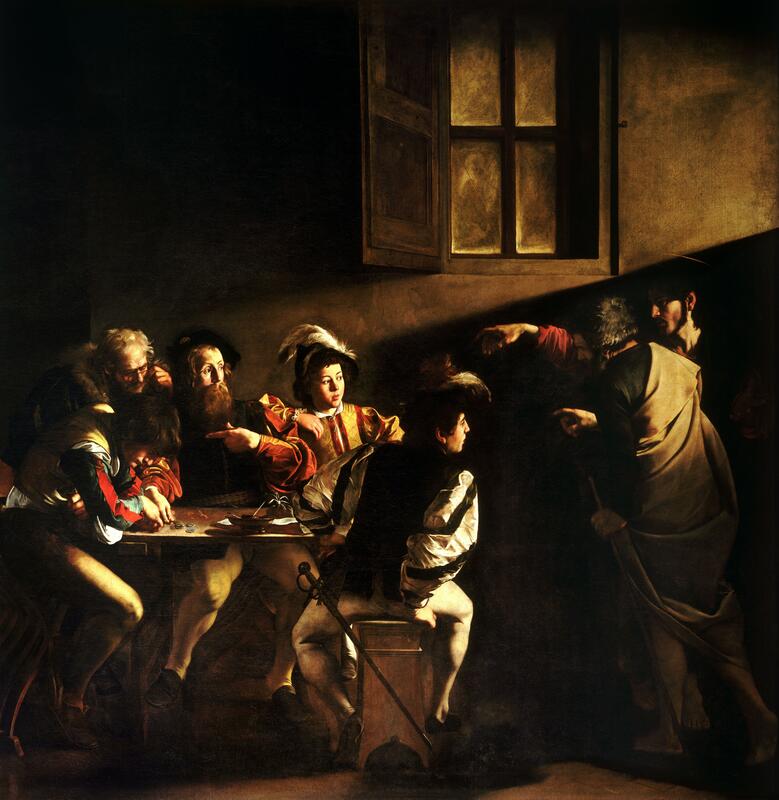 Caravaggio’s painting “The Call of St. Matthew” helps us understand discernment at an even deeper level. In the painting, three fingers are pointing at Matthew. The first is that of Our Lord; the second that of St. Peter, who represents the Church; and the third is that of Matthew himself, who represents all people who are called by the Lord to glorify Him in some particular vocation. These are the three “players” at work in every person’s vocation: God, the Church, and the individual soul. In what follows, we will take a closer look at each of these players in relation to discernment. Firstly, God is at the forefront of all vocations. He is the one who calls, guides, and orders every vocation according to His perfect, divine plan. He who creates each soul also knows the best path of life for each soul. God offers every individual a specific and unique mission to carry out here on earth. A vocation, therefore, is primarily God’s initiative – it is a gift from God to the soul. The primacy of God’s role in discernment cannot be overstated or forgotten! Since God is the giver of every vocation, the individual is primarily the receiver of his or her own vocation. This is why discernment is first and foremost an act of reception rather than an act of “doing” on the part of the individual. One’s vocation is a gift to be accepted, not a problem to be figured out. But this does not mean discernment is easy or requires no work on the part of the individual. Prayer is the work of the individual who, with the help of the Holy Spirit, mines through the “dirt” of one’s own desires, history, relationships, and spiritual experiences in order to discover the unique and specific mission to which God has destined the soul for all eternity. And just like the one who finds the pearl of great price (Mt. 13:45-46), the individual who finds his or her vocation responds with great joy and full freedom! He or she responds to the Giver of gifts with the very gift of his or her own life. Finally, the Church’s role in an individual’s vocation is to nourish and confirm God’s gift. One way the Church nourishes vocations is through encouragement. My own vocation was nourished at a young age when many people encouraged me towards the priesthood, even when I had no desire to be a priest. Even to this day, words of encouragement from priests and close friends provide me with great strength to continue on in God’s will. Another way the Church nourishes vocations is through prayer. Jesus says, “Therefore ask the Lord of the harvest to send laborers into the harvest” (Lk. 10:2). The Church confirms a vocation, especially to the priesthood or consecrated life, by testing it as gold in fire. An individual, therefore, who has felt a calling to the priesthood or consecrated life submits him– or herself to and seeks approval from the Church, who is guided by the Holy Spirit. A person’s vocation is first and foremost a gift from God. He calls each of us to a specific and unrepeatable mission to love and serve Him in this life. It is a joy to set out in search of this great gift, and an even greater joy to find it! With our own efforts, and with the guidance of the Church and the Holy Spirit, God helps us sift through our life’s “dirt” in order to find the golden treasure that is His will. Image: The Calling of St. Matthew, Caravaggio.